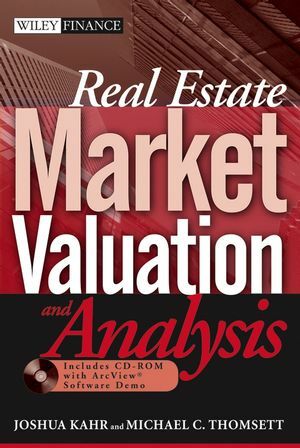 This in-depth look at the core tools of real estate valuation will show you how to analyze the real estate market and assess the financial feasibility of a project. Many people go with their instincts or past experience when reviewing the financials and fail to utilize the useful data and analytical tools available in this field. Get the analytical data and tools you need to assess the financial feasibility of any project. Joshua Kahr is the President of Kahr Real Estate Services, LLC, a consulting firm with specialization in real estate market analysis, financial software training, and financial modeling. He is also Adjunct Assistant Professor of Real Estate at New York University, where he teaches in the Master of Science in Real Estate program. Michael C. Thomsett is a professional author with over sixty published books. He has published numerous successful book projects with John Wiley & Sons, including Getting Started in Rental Income and Getting Started in Options, now in its sixth edition. Thomsett has been a management consultant in the securities industry as well as a real estate investor. Chapter 9: Mixed-Use Real Estate Analysis. AUTHOR IS A PROFESSOR. Joshua Kahr is Adjunct Assistant Professor of Real Estate at New York University where he teaches in the Master of Science in Real Estate program. STRONG AUTHOR PLATFORM: Book would be used by approximately 150 students in author's NYU course and 60 students at Baruch annually. NEWSLETTER: Author has monthly client newsletter going to 500 people. PROMOTIONAL OPPORTUNITIES: New York University Real Estate Institute to promote the book at conferences. There are three a year and they are attended by about 300 people per conference.